3D printers are not only cool and amazing, they could be dangerous too. About 2 weeks back, a guy named Cody Wilson took up the challenge to print a gun entirely out of a 3D printer. He said that the project will be done in a couple of week’s time and it looks like the day is finally here. 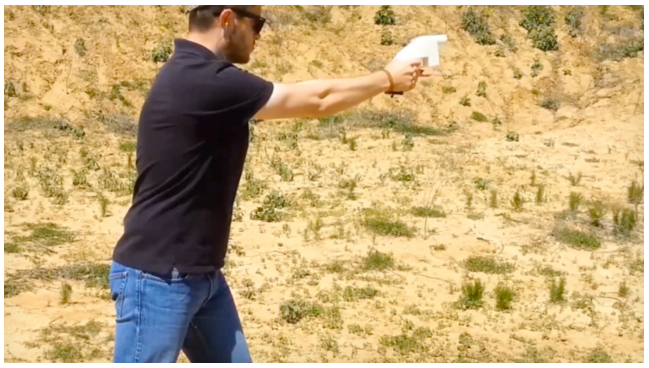 Few days back, Cody Wilson showed off the “Liberator” handgun that he printed, but will it work? Watch the video to find out. The Liberator handgun consists of 16 parts, 15 of which are printed with a 3D printer while the last part is a simple nail you can get in any hardware store. The Liberator was then put through a series of tests whereby the trigger was pulled by a string. Cody Wilson then took the gun and fired a shot himself and the result? Here’s a spoiler in case you haven’t watched the video yet – both Cody and the gun survived with no damage at all though, the gun did receive a crack on a pin but I assume it could be printed back in no time. Catch the video of the firing process below.